The new John Deere Z700 Series ZTrak™ zero-turn mowers bring commercial-grade construction and comfort to the residential market. Five models, including the Z720E, Z735E, Z730M, Z735M and Z740R, offer homeowners a durable solution that will stand up to the demands of mowing larger properties while enhancing operator comfort. Featuring 23 to 25 horsepower (17.2 to 18.6 kW) engines, a commercial-grade transmission and heavy-duty frame, the Z700 Series mowers provide homeowners with the power, performance and durability that is needed when maintaining large properties. Additionally, a large fuel tank provides enough run time to get through long mowing sessions. The integrated park brake allows the operator to audibly hear the brake click into place. The brake automatically engages when steering levers are moved outwards, and disengages when the levers are pulled together, allowing the operator to quickly start and stop work in a natural motion. 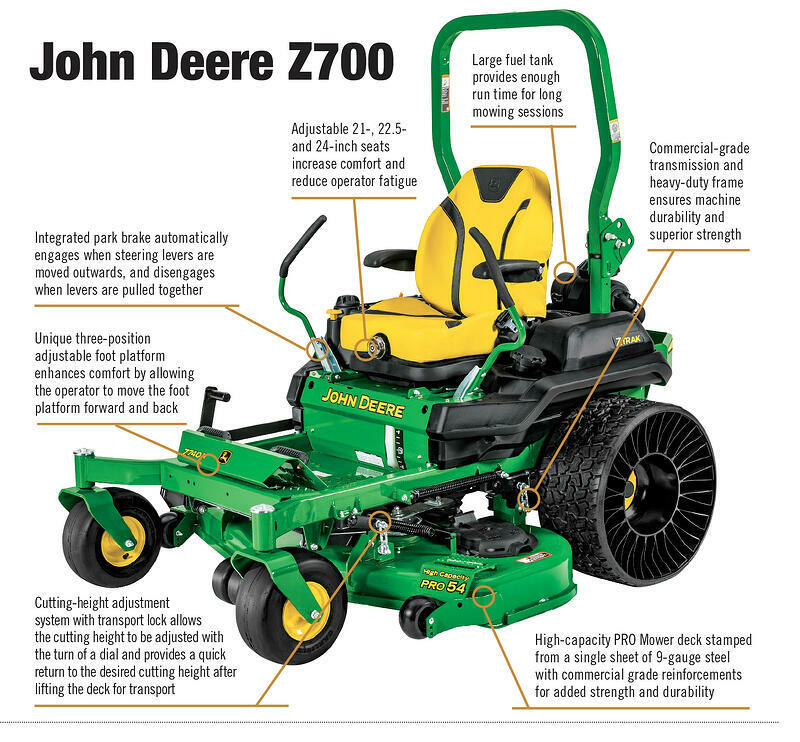 The Z700 Series machines are equipped with a High-capacity PRO mower deck in one of three sizes: 48-, 54- and 60-inch. The mower deck is stamped from a single sheet of nine-gauge steel with commercial grade reinforcements for added strength and durability. The cutting height adjustment system with transport lock allows operators to adjust the cutting height with the turn of a dial, and then quickly return to the desired cutting height after lifting the deck for transport. Operator comfort is also at the forefront of the Z700 design, which includes an adjustable, three-position foot platform and high-back seat. The three-position foot platform is designed so operators can move it forward and back for a comfortable position, regardless of their height. Additionally, the Z730M and Z735M models are equipped with the ComfortGlide system, an industry-first. The ComfortGlide suspension protects the operator from jarring while mowing, providing up to two-inches (50.8 mm) of fore and aft travel to absorb bumps for enhanced ride quality. Equipped with large rear tires, the Z700 series offers operators a gentle ride regardless of speed. Optional Michelin® X® TWEEL® Turf Airless Radial Tires are available on the Z740R model, providing extra reliability and enhanced ride quality. With MICHELIN X TWEEL Turf Airless Radial Tires, flats, patch kits and replacement tires are a thing of the past. Additionally, they have a wear life that is three times that of a traditional pneumatic tire.